This report provides an in-depth guide for retailers, restaurateurs and other businesses that are considering installing ATMs on their premises. Retailers and restaurateurs have a range of choices when it comes to selecting an ATM business model. One option is buying or renting ATMs from an independent ATM deployer (IAD) and levy surcharge fees on ATM transactions. Another option is generating retail income, and possibly a share in surcharge revenues, by providing floor space for an IAD to install an IAD-owned ATM in-store. 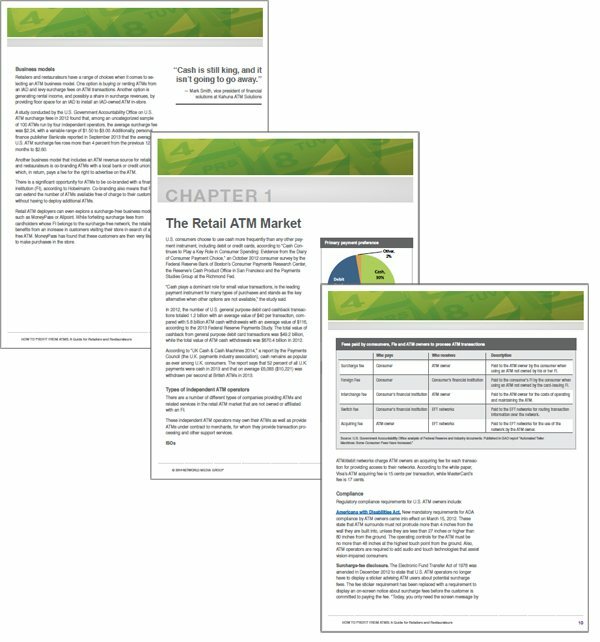 This new guide gives an overview of the retail ATM market and explains the role played by the various participants, such as IADs, and the services they provide. In addition, it explains the revenue opportunities for retail ATM deployers and provides guidance on issues such as finding the location in the store for an ATM, regulatory compliance, security measures for protecting ATMs and the type of insurance needed by ATM deployers.